“Abacus” designs and manufactures “Shell & Tube Heat Exchangers” which are the most widely and commonly used Heat Transfer Equipment in Petrochemical, Pharmaceutical, Oil & Gas and Power Generation Industries. “Abacus” Shell & Tube Heat Exchangers are the product of a team which has extensive process fundamental knowledge attained through years of practical and theoretical designing and operational experience. 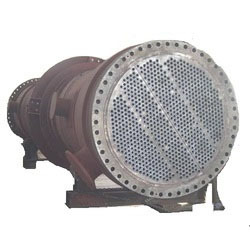 Each of our manufactured Heat Exchanger is warranted for long trouble free performance with minimal maintenance. “Abacus” Shell & Tube Heat Exchangers are made robust by Design to withstand toughest of stresses present both at the fabrication and operational levels. “Abacus” Shell & Tube Heat Exchangers Thermal and Mechanical Designing is carried out in-house. Thermal Designing determines the unit sizing including tubes, baffles, Shell etc. and mechanical Designing is done in order to achieve required thickness of each component of the heat exchangers, in confirmation of material, pressure and service requirements. “Abacus” Shell & Tube Heat Exchangers are designed & built in a wide variety of size and metallurgy as per customer’s requirement. Length can vary form 0.5 meter 20 meters & Diameter can be very from 0.15 meter to 2.0 meters. The design and test pressure can be upto 300 Kg/Cm2G. Also the metallurgy offered includes materials like Duplex Steel, Admiralty Brass, Naval Brass, Hastelloy, Inconel, Monel, Cupro Nickel, Titanium other than the most commonly used various Carbon Steel and Stainless Steel Grades. 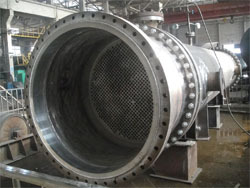 The Heat Exchangers are fabricated in accordance with TEMA / ASME / API & ASHARE Standard requirements. Heat Exchangers for Sea Water Marine applications with Monel, Brass and Cupro-Nickel construction designed & offered as per customer specific requirements.